Earlier this year we endorsed outsider businessman Curt Clawson in the Special Election to fill the vacant Florida District 19 House seat. The Washington GOP establishment tried to anoint Florida state Senator Lizbeth Benacquisto and special interests in the health care industry lined-up behind former state Representative Dr. Paige Kreegel. After a tough campaign, in which Clawson was savaged by the other candidates and their Washington consultants, the outsider prevailed (without even having to go to the widely anticipated runoff) and now sits in Congress representing the people of Southwest Florida. And we put emphasis on the phrase “representing the people “ of Southwest Florida. When the House GOP leadership was preparing to roll over and give Obama and the Democrats what they wanted on funding services for the wave of illegal aliens that flooded our Southern border earlier this summer, the Bonita Springs lawmaker said he wouldn't vote for a leadership-backed funding bill unless GOP leaders also moved to defund an Obama administration program that defers deportations of young immigrants already in the U.S. Some conservatives already had dropped their demands to defund the Deferred Action for Childhood Arrivals (DACA) program. But Clawson and a small band of hardliners, including Michele Bachmann of Minnesota, Steve King of Iowa and Marsha Blackburn of Tennessee, had not. The vote promised to be close, and as Ledyard King, of The (Ft. Myers, FL) News-Press Washington bureau observed, House leaders needed every Republican they could muster. They had no choice but to pull the bill from consideration while they worked out a compromise to win back the support of conservatives, such as Clawson, King, Bachmann and Blackburn. Clawson's all-or-nothing stance didn't go over well at the caucus meeting, reported King. Heads started shaking. Some members grumbled about having to delay their summer recess. A few grew loud and angry. Others worried how their constituents would react if lawmakers left town without passing a measure to address the border crisis. Ultimately, House leaders brought two bills to the floor that night — a funding bill and a measure to defund the DACA program. Both passed. Voting for the funding bill without also voting to defund DACA "would mean rolling on my constituents," Clawson told Ledyard King. (emphasis ours) "At that moment, I didn't think of myself as a freshman, and I also thought there was an undercurrent of people who were thinking the same thing that I was." Clawson also voted against a temporary extension of a highway funding bill (which passed overwhelmingly) because he thought it relied on financing "gimmicks" that the government wouldn't allow businesses to use. And he opposed the Student and Family Tax Simplification Act because he said it could have made illegal aliens eligible for tax credit refunds. When Congress comes back to Washington, and resumes work for a few weeks prior to the November election, GOP leaders are expected to endorse an extension of the Export-Import Bank. Clawson told Ledyard King he is leaning hard toward opposing it but wants to see the language first. He thinks the bank chooses favorites and serves too many large businesses that don't need it. Retiring Rep. Michelle Bachmann, a favorite of the Tea Party movement, who endorsed Clawson in his congressional campaign, calls him a "quick study" and a hard worker. She praised him for his efforts to cut back federal spending and oppose Common Core. "In the brief time he's been here, he's been able to establish a reputation as somebody who's there not just to pass the time," Rep. Bachmann told The News-Press. "He's genuinely interested in performing a job. He's done what he said he was going to do." 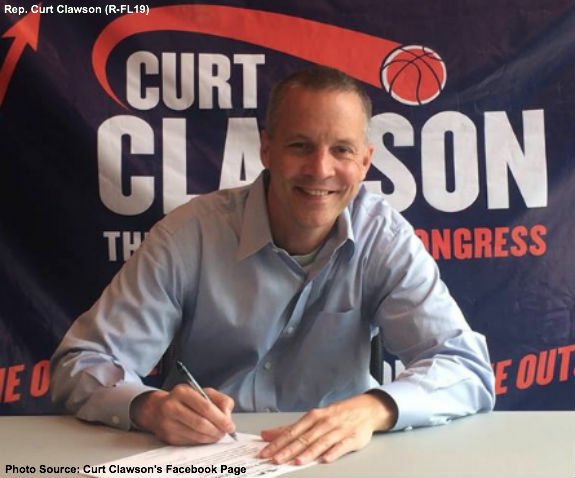 "My model is to represent and stand for conservative values while not being an isolationist and working to get things done," said Clawson. "And I think we can do that." Anyone reading this think we conservatives would have gotten that same voting record out of Benacquisto or Kreegel? Didn’t think so.